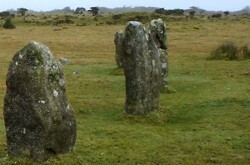 Bodmin Moor and the standing stones. for profaning the Lord's Day with hurling the ball. A further legend suggests that the stones cannot be accurately counted. This ties in with plot threads featured in Barrow Hill. The fictional archaeologist, Amelia Rumford, was written into the story to expose that, not only, can the stones at Barrow Hill not be counted, but she thinks they may be able to move! Another Barrow Hill connection, in this area, is the Cross of King Doniert. Two large carved stones, from the 6th century (shown above), mark the death of the Ancient British King of Dumnonia. The tales of his slumber, beneath the earth, may well have influenced Barrow Hill's sleeping power force. 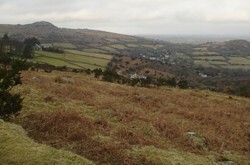 Beyond stone circles, barrows and the ancient mines, Bodmin Moor is also famous for it's 16th century Jamaica Inn, and the urban legend by the name of "The Beast of Bodmin Moor". Visitors and locals have spotted, what is believed to be, a large predatory cat, not unlike a panther! Whether the sightings are genuine or not, the moor is an unearthly place when the mists descend. Do not get stranded out there, and never go alone. Getting there: The Hurlers, King Donierts Stone, the mine buildings and the moors are all accessible near the small town of Minions. See the map for location. The area is best approached by car, as the moors are desolate places for the unwary walker. Map interests: The 'cairns', stone circles and 'tumuli' are all featured clearly. Even a quick glance at the map exposes Minions to be a fantastic location for antiquity. 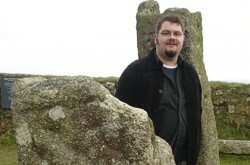 Whether you are interested in stone circles, the beast of Bodmin or UFOs, you are bound to find something of interest. After exploring the moors, pop along to The Jamaica Inn (at Bolventor) for dinner, some warming wine and a bed in the many haunted rooms.